All across America people ridiculed and smashed Henry D. Cogswell’s fountains, but this one survives in downtown Pawtucket. Cogswell – a dentist, millionaire, and crusader in the temperance movement against alcohol – had not always been a wealthy man. Born in Connecticut in 1820, young Cogswell sunk into poverty after his parents died. As a teenager he walked fifty miles to Pawtucket to start work in the mills. He managed to become a dentist, and in 1847 he set up a local practice. Lured to California by the Gold Rush, he made a fortune in real estate. The newly-minted millionaire assumed an ancestral coat of arms and began to call himself a “capitalist,” but he never forgot his penniless past. He determined to uplift the working class through charitable deeds. As Cogswell saw it, drunkenness led to pauperism. If poor people had an alternative to alcohol – like clean, cold water to drink – they might renounce liquor. And so, starting in 1878, Cogswell arranged to send free drinking fountains to towns throughout the United States. Cogswell’s actions might have been well-intentioned, but he made some regrettable design choices. His fountains often came topped with a statue that resembled Cogswell himself. This figure, which he referred to as the “Guardian of the Fountain,” held a scroll in one hand and a glass of water in the other. Engravings at the base commanded passersby to work hard and avoid dissipation. The fountains proved irresistible targets for vandals. Drunken revelers, rowdy art lovers, and citizens who deemed the statues to be in poor taste all moved to destroy them. Wherever he appeared, the “Guardian” suffered attacks, including topplings with a lasso, lake immersions, and a kidnapping. When Mark Twain spotted a Cogswell fountain in Rochester, New York, he remarked, “It has a putrid, decomposed sort of a look that is offensive for a delicate organism.” Others agreed. 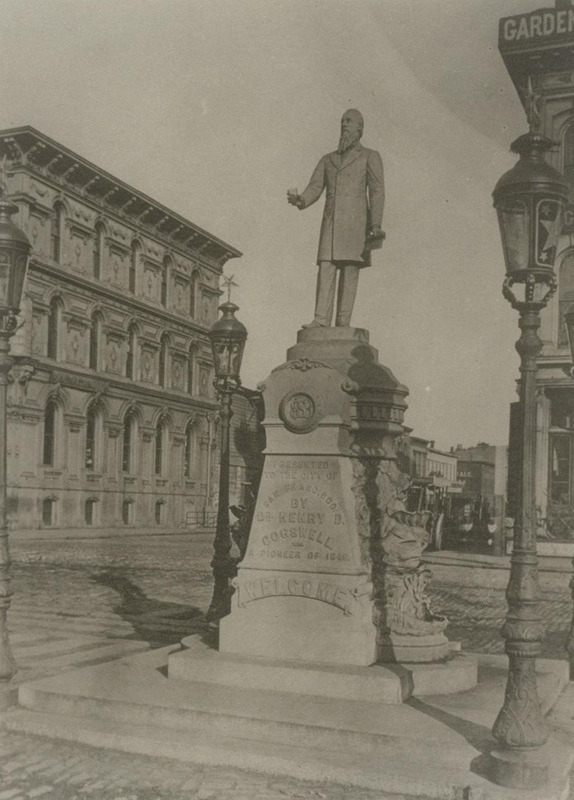 In 1885 an unidentified party dispatched the Rochester statue by bashing it to bits with crowbars. The Pawtucket fountain escaped the mobs, perhaps because it came decorated with a heron rather than Cogswell himself. Residents welcomed it with speeches and song when it arrived in 1880. The fountain provided water, “God’s Free Gift to Man and Beast,” from high spouts for humans and lower spouts for horses, dogs, and any other animals in need of refreshment. On the foreheads of the cat-like gargoyles, one can still see marks made by rings where drinking cups once hung. When the fountain became inconvenient downtown, the city transferred it to Oak Grove Cemetery. But mourners deemed it too cheerful for that spot, even after they had the word “Welcome” removed from the bottom of the base. The fountain moved to Slater Park in 1904 before the city finally restored it to its original location in 1990. At that time, a time capsule found embedded at the top of the column yielded soggy papers and an Indian Head penny. 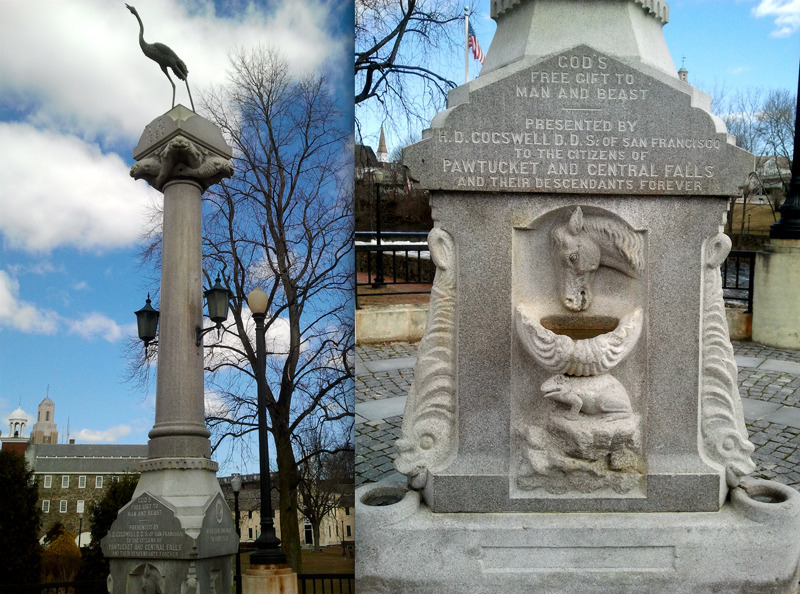 Today Pawtucket’s Cogswell fountain is one of few still in existence. It stands defunct, a monument to a man who excelled at making money but botched giving it away. 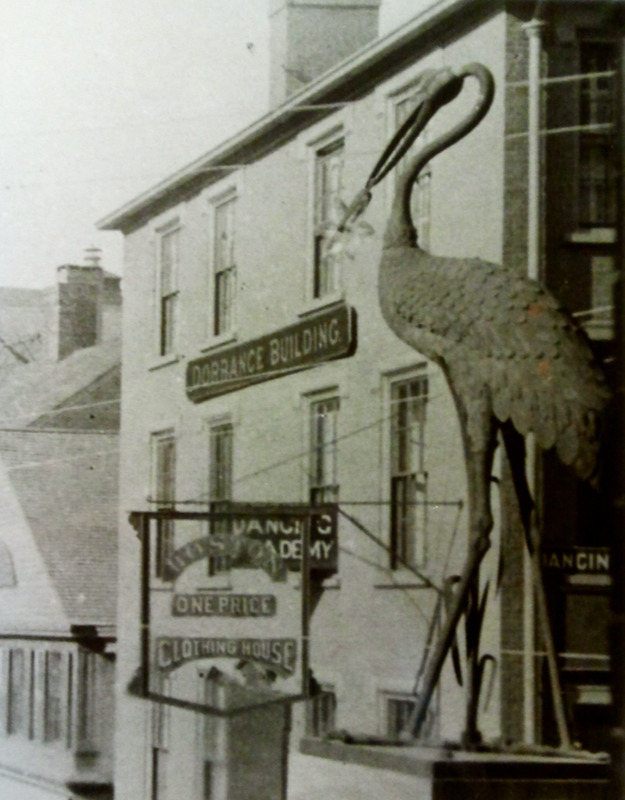 Cogswell Fountain Heron: A bronze heron with a glass star in its beak sits atop the fountain at its original location in 1886. This heron disappeared, perhaps lost to a hurricane. Only its stick-like feet remained mounted to the pillar. 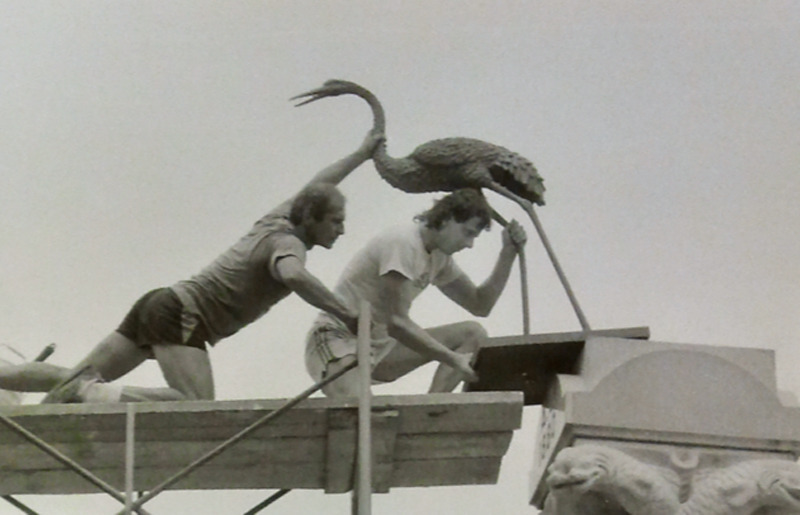 Replacement Heron: Restorers installed a replacement heron in 1991 when the Cogswell fountain was moved back to its original location in Pawtucket. This one is a modern garden ornament found in a Newport shop. 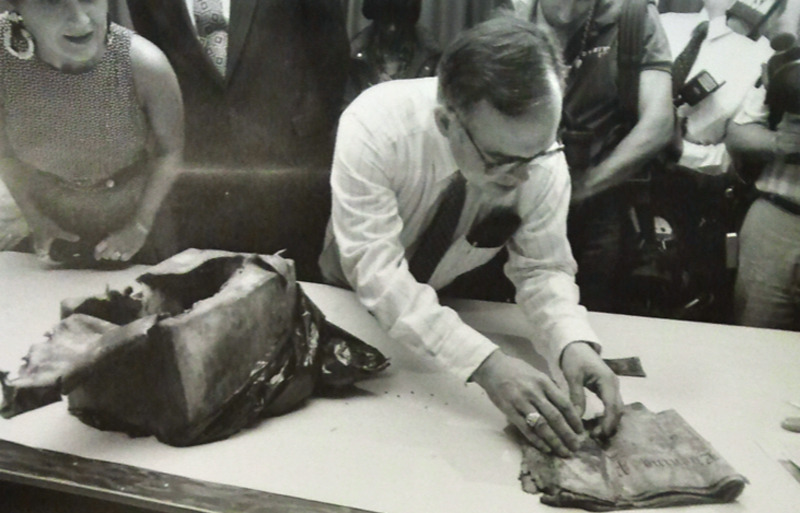 Time Capsule: Albert Klyberg, then director of the Rhode Island Historical Society, opens the Cogswell fountain time capsule in 1990. The capsule had been tampered with – seemingly pierced with a shovel decades earlier – and water had damaged the newspapers and other documents inside. Pawtucket area residents suggested items for a new time capsule, including photos of Desert Storm troops, My Little Pony toys, and Butterick sew­ing patterns. 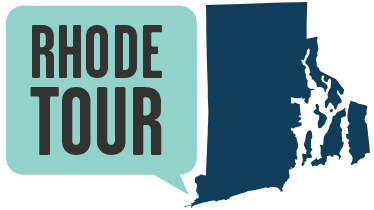 Kathrinne Duffy, ““God’s Free Gift to Man and Beast”,” Rhode Tour, accessed April 22, 2019, http://rhodetour.org/items/show/31. Cogswell Fountain Collection, Elizabeth J. Johnson Pawtucket History Research Center, Pawtucket, RI. Moffat, Frederick C. “The Intemperate Patronage of Henry D. Cogswell.” Winterthur Portfolio 27 (1992): 123-143. Scharnhorst, Gary, ed. Mark Twain: The Complete Interviews. Tuscaloosa: University of Alabama Press, 2006. Moffat, Frederick C. “The Intemperate Patronage of Henry D. Cogswell.” Winterthur Portfolio 27 (1992): 123-143. Scharnhorst, Gary, ed. Mark Twain: The Complete Interviews. Tuscaloosa: University of Alabama Press, 2006.